Our efforts continue in the fight to support and protect undocumented students and their families, and we need your help. Attacks on immigrant communities are real and constant. There is a lingering uncertainty around DACA (Deferred Action for Childhood Arrivals) and an aggressive increase in family separation, detainment, and deportation. Please join us for an important 2-hour training that will focus on how UNM faculty and staff can advocate for undocumented students on campus. We are grateful for your support of and solidarity with immigrant communities and ask you to forward this invitation on to your networks. Please help us grow allyship throughout UNM by personally inviting at least three of your colleagues. Members of the New Mexico Dream Team are leading the way to designate the University of New Mexico a “Dream Campus,” a place where undocumented students are fully welcomed and supported.” As educators, we play a vital role in the protection and inclusivity of undocumented students on campus. 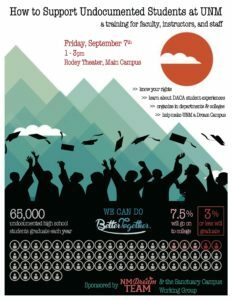 Every year 65,000 undocumented students graduate high school. Of those students 7.5% of them go onto college and only 1-3% of them graduate (US Dept. of Education, 2015). There are numerous reasons why undocumented students do not graduate college, including an arduous work schedule, financial instability, and family separation. Thus, by creating a Dream Campus at UNM we can build the institutional infrastructure to support and protect undocumented students. detailed information about how we can better organize within our departments and colleges to make the Dream Campus designation a reality.